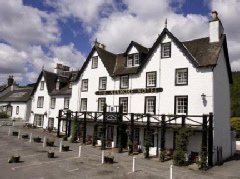 Established on November 3rd 1572, The Kenmore is said to be Scotland’s oldest inn. It certainly looks the part. The Kenmore features 40 guest bedrooms, with dining available in the Grill Room or the Boar’s Head Bar. Pitlochry and Perth are within reasonable driving distance, while those keen on the great outdoors will find much to enjoy in the locality including Loch Lomond and the Trossachs National Park.